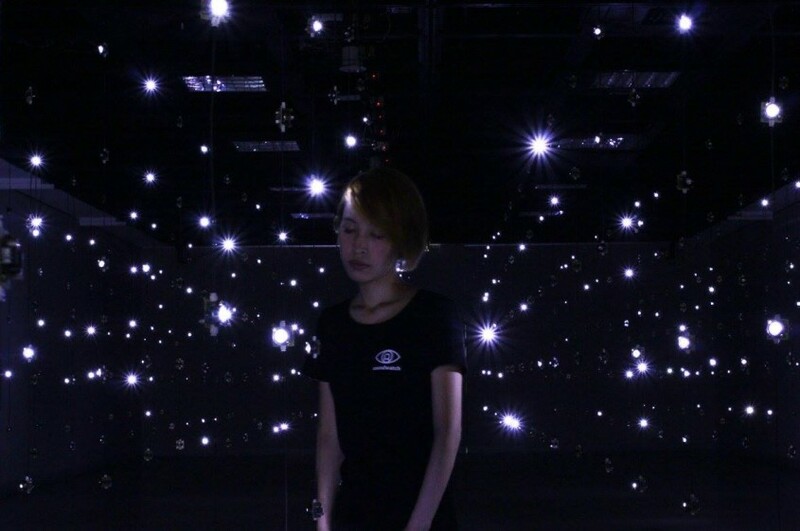 One of Fujui Wang’s major exhibitions in 2015 is “Moving Sound Forest Exhibition” which was opened at New Taipei City Art Center. 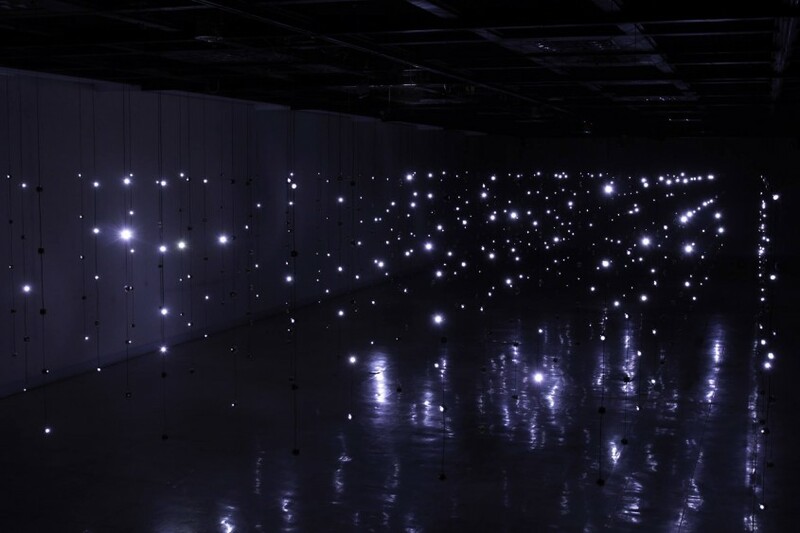 The idea is extended from that of “Sound Forest under the Cloud” exhibition in Digital Art Center/DAC in Taipei in 2010 where only 250 Sound Dots were included. 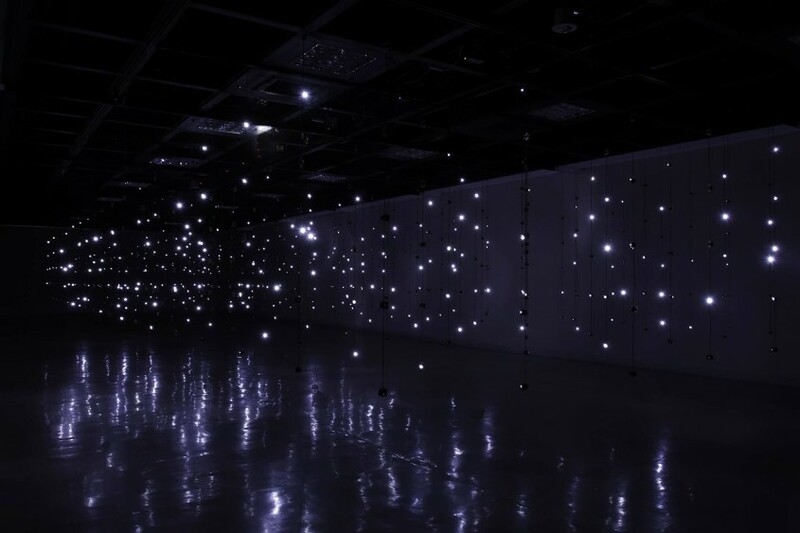 Yet after checking the size of the space at New Taipei City Art Center, Fujui, my teacher, and I had the idea of increasing the number of dots into 1000 and trying to let the sound dots with respective sound characters collide and traverse in the space, creating energy of many levels. Sound Dots have undergone many different ways of move in diverse spaces. In different venues, they all smoothly bring about different sounds. 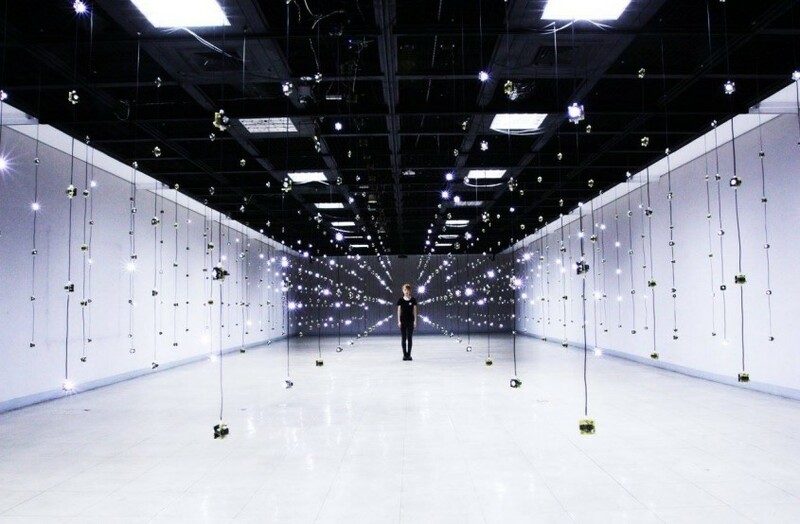 Combined with different kinds of spaces, different numbers of Sound Dots create experiences of different realities. How to describe Fujui Wang’s work? In a performance titled “Tasks” curated by the artist duo, Jasmin and Bilwa, in an abandoned beer factory in Berlin, nine dancers held tiny devices that produced physical sounds in their hands. Their movements in the immense space produced sounds that started from the dancers’ hands and hit the walls. The echoes went back and forth, superposing one another to make a 3-dimensional feeling of flow. Rather, we can describe the work with the following metaphor: when we’re in my teacher’s sound forest, we felt the sounds automatically keep on superposing, intersecting, alternating, vibrating, becoming organic, near and far…at the instants when our ears chased after them to identify them. By spreading so many Sound Dots in the basement of the factory, Fujui created a situation where one promenades with one’s consciousness in a deep forest alone. 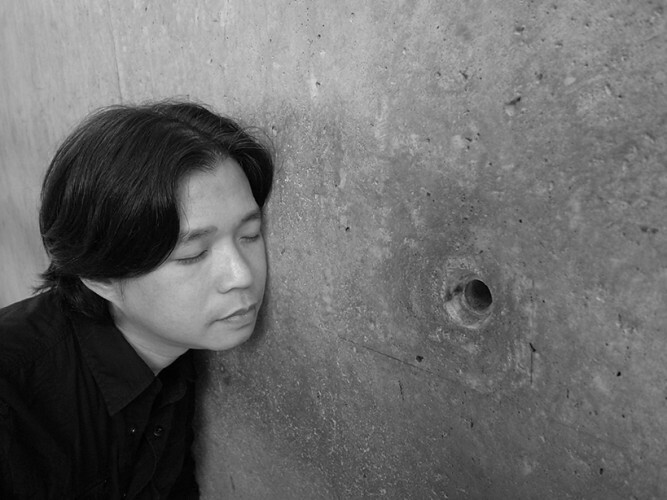 Fujui said he has been seeking all the possibilities of sound. Perhaps for this reason, his work unconsciously represents a flavor that corresponds to nature. I wonder whether if everyone discerned the circumstantial sounds made with Sound Dots arranged by Fujui during the opening performance. There was a section of a similar sound of raindrops. The sound of water makes us calm and bears the imagery of nature. 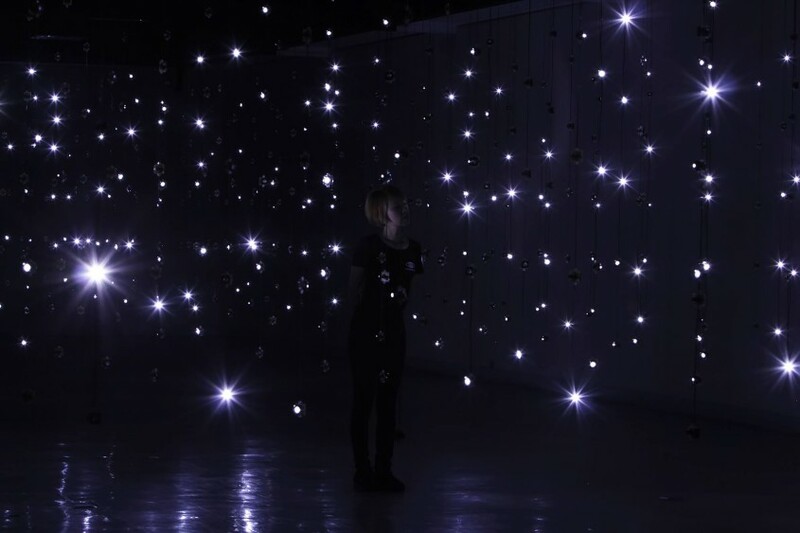 As for Sound Dots, although there were technological sounds created in the collisions of electronic chips as well as LED lights produced under the crashes, they were transformed into natural insects’ cry and the starlight. The entire opening performance made one feel like being overwhelmed by the ocean. Maybe in one’s life, beautiful and comfortable sounds should be like those of waves and of amniotic fluid inside the womb, immense and steady, calm and slow, rich and extending. Just like the flow in the powerful crevices between life and death. Certainly, the tension of sound felt in one’s real experience cannot be described with any language or words. It cannot be depicted in others’ minds either. Fujui’s exhibition will be shown until October 19. One can define how he/she feels about such sound.